Sheriff Joe Arpaio said Wednesday it will be a cold day in Maricopa County before one of his officers apologizes for taking an attorney’s confidential files. He was responding to Maricopa County Superior Court Judge Gary Donahoe, who on Tuesday ordered a county detention officer to apologize for a bizarre incident in which he was caught on a courtroom security video sneaking a confidential document from a defense attorney’s file. Donahoe ordered officer Adam Stoddard to hold a press conference before Dec. 1 to apologize to the attorney or else face jail time. An attorney for the sheriff, Tom Liddy, went even further, saying it’s unlikely Stoddard will go to jail for refusing to apologize. “Folks should not hold their breaths,” he said. But the sheriff’s office, which runs the county jails, doesn’t plan to defy the order outright. Liddy said the agency will challenge it in a higher court. The attorney said the order violates Stoddard’s rights to free speech. Liddy also said it violates Stoddard’s right to due process because he did not have a trial in front of a jury. “It’s the most bizarre thing that I’ve seen in my 14 years (of practicing law),” he said. The whole uproar goes back to Oct. 19, when Stoddard was caught on a courtroom videotape taking a document from the file of public defender Joanne Cuccia. The attorney was speaking before Superior Court Judge Lisa Flores during a sentencing of her client, Antonio Lozano, for assaulting a fellow inmate. Cuccia had her back turned to Stoddard when he walked up to the defense table, began reading a document and then pulled it from her file to have a copy made. In the weeks since then, Donahoe, the county’s highest-ranking criminal judge, has ordered the sheriff’s office to explain why Stoddard believed he had the right to do that. After all, the files an attorney keeps are supposed to be protected by the attorney-client privilege, a near-sacred right in the legal community. Stoddard told the judge he happened to glance down at the table when he saw four words – “going to,” “steal” and “money” – all grouped in the same sentence at the bottom of the document. Because the defendant was a member of the Mexican Mafia, Stoddard said he thought Lozano might be passing coded messages to other gang members through his attorney. But Donahoe rejected that story on Tuesday, saying in his order there’s no way “a reasonable detention officer” would read the document and think a crime was taking place. Donahoe said Stoddard’s actions amounted to “misbehavior and harassment” of the defense attorney. “My client was delighted that she was finally able to have someone, most importantly this judge, hold that she did nothing wrong,” said Craig Mehrens, a veteran Phoenix lawyer who has taken up Cuccia’s cause. In more than 40 years practicing law, Mehrens said he has never heard of a judge forcing somebody to hold a news conference to apologize. As for Liddy’s contention that the order violates the detention officer’s right to due process, Mehrens said the sheriff’s attorney is going to have a tough time with that one. The judge cited case law that shows he has the right to throw an officer of the court in jail on a civil contempt charge without having to go through a jury. Mehrens also pointed out that Stoddard and the sheriff’s office had three days worth of hearings in recent weeks to defend their actions. Yet they called no witnesses in their defense and mounted little explanation as to why Stoddard took the confidential document. “What more due process does Mr. Liddy expect Mr. Stoddard to have?” Mehrens said. Amid all the back-and-forth, the original sentencing of Lozano, the Mexican Mafia member, has been put on a holding pattern. It had been scheduled for a do-over on Wednesday, but earlier this week, the original judge pushed it back to Dec. 14. Still, it’s uncertain whether the sentencing will even happen. Lozano’s new attorney, Maria Schaffer, said last week she plans to ask for the charges against him to be dropped in light of everything that’s happened. She declined to comment Wednesday about Donahoe’s ruling. Sheriff Joe being his usual obnoxious self. And like all other similar incidents, he’ll get away with it. 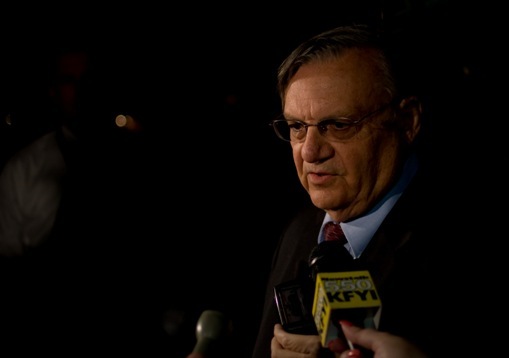 There is no law in Maricopa County; there’s just Sheriff Joe, and whatever web site he’s found to back up his claims that he can do what he wishes with impunity. Sheriff Joe being his usual obnoxious self. And like all other similar incidents, he'll get away with it. There is no law in Maricopa County; there's just Sheriff Joe, and whatever web site he's found to back up his claims that he can do what he wishes with impunity. Why do you people keep re-electing this clown? I’m starting to wonder if he really is re-elected. I don’t live in Maricopa County (thank God! ), but I’d sure be interested in knowing who is in charge of counting the votes. Apparently the sainted Sheriff uses intimidation on virtually everyone. Why would he stop at a little specialized vote counting? I'm starting to wonder if he really is re-elected. I don't live in Maricopa County (thank God! ), but I'd sure be interested in knowing who is in charge of counting the votes. Apparently the sainted Sheriff uses intimidation on virtually everyone. Why would he stop at a little specialized vote counting? The attorney “Tom Liddy” says: “it violates Stoddard’s right to due process because he did not have a trial in front of a jury. It’s the most bizarre thing that I’ve seen in my 14 years (of practicing law).” A contempt hearing is before the court, not a jury – how long have you been practicing? And, the most bizarre thing I have seen in my nine years of practicing law is such a blatant and absurd violation of the attorney-client privilege. Those documents are privileged and, as an attorney himself, he know’s better. Shame on you Liddy – or are you just a complete moron? Either way, it is no excuse. The attorney “Tom Liddy” says: “it violates Stoddard’s right to due process because he did not have a trial in front of a jury. It’s the most bizarre thing that I’ve seen in my 14 years (of practicing law).” A contempt hearing is before the court, not a jury – how long have you been practicing? And, the most bizarre thing I have seen in my nine years of practicing law is such a blatant and absurd violation of the attorney-client privilege. Those documents are privileged and, as an attorney himself, he know's better. Shame on you Liddy – or are you just a complete moron? Either way, it is no excuse. You are completely correct, the officer has not recieved a trial. Maybe the Sherriff ought to arrest the officer and charge him with the theft the entire world witnessed. Then the officer will get the trial he so obviously deserves. When you’re charged with contempt of court, you don’t get a trial by jury. He wasn’t charged with theft, which WOULD have required a trial by jury. Hmmm… Freudian slip on Mr. Liddy’s part? Maybe he knows that’s what the deputy should have been charged with (theft), not just a simple contempt charge with a token slap on the wrist? Fire the officer, charge him with theft. If Joe refuses to obey with the order, arrest Joe for contempt of court. If none of the sheriffs will take him into custody, call in the State Marshals. Case closed. I am a former criminal defense lawyer. I saw some very offensive behavior by law enforcement officials of all types during my career. However, the deputy’s actions on that video were beyond the pale. I am even more appalled that the sheriff appears to see nothing wrong with his minion’s behavior. How can the citizens of Maricopa County accept the sheriff’s absolute disegard for our constitution – the very bedrock of our American way of life. Why do you continue to re-elect this man? Do you hold your hatred for illegal immigrants above all else? If your sheriff believes that this was appropriate behavior, does it not occur to you that other defendants, regardless of race and national origin, may have been denied fair and proper proceedings? I can’t believe that this is the first time due process has been ground into the Maricopa County dust. Throw the rascal out of office at your first opportunity! I am a former criminal defense lawyer. I saw some very offensive behavior by law enforcement officials of all types during my career. However, the deputy's actions on that video were beyond the pale. I am even more appalled that the sheriff appears to see nothing wrong with his minion's behavior. How can the citizens of Maricopa County accept the sheriff's absolute disegard for our constitution – the very bedrock of our American way of life. Why do you continue to re-elect this man? Do you hold your hatred for illegal immigrants above all else? If your sheriff believes that this was appropriate behavior, does it not occur to you that other defendants, regardless of race and national origin, may have been denied fair and proper proceedings? I can't believe that this is the first time due process has been ground into the Maricopa County dust. Throw the rascal out of office at your first opportunity! When you're charged with contempt of court, you don't get a trial by jury. He wasn't charged with theft, which WOULD have required a trial by jury. Hmmm… Freudian slip on Mr. Liddy's part? Maybe he knows that's what the deputy should have been charged with (theft), not just a simple contempt charge with a token slap on the wrist? So, if the Sheriff or the Deputy don’t like what this Judge has ordered on a Civil Contempt action, I guess then that they would rather had a Criminal Trial held or have the defense attorney and her client file a FEDERAL 1983 Civil Rights Violation case against the Deputy, his supervisor’s, the Sheriff, and the County! The Court security certainly did not have a warrant for the actions that they took and propably could have easily gotten one just upon the sworn testimony of the first deputy. So, if the Sheriff or the Deputy don't like what this Judge has ordered on a Civil Contempt action, I guess then that they would rather had a Criminal Trial held or have the defense attorney and her client file a FEDERAL 1983 Civil Rights Violation case against the Deputy, his supervisor's, the Sheriff, and the County! The Court security certainly did not have a warrant for the actions that they took and propably could have easily gotten one just upon the sworn testimony of the first deputy. In re the comments about trial by jury and civil contempt: I was under the impression that the person charged with civil contempt “holds the keys” to get out of jail (i.e. if that person does what is ordered, he gets or stays out of jail). That is not the case here, where Ms. Cuccia holds the power over the Officer. The Officer’s actions (issue a sincere apology at a press conference) are necessary, but not sufficient for him to stay out of jail. If Ms. Cuccia does not accept the apology, then the Officer goes to jail. I assume that this is what Mr. Liddy is referring too (but maybe I am a moron too, Jsun). mahtso – I understand your comment is a long time ago, but I just read it now. It is not always, and I’d say not a majority of the time, that someone held in contempt gets to avoid the punishment by some action. Yes, frequently, but ai wouldn’t say a majority of the time. You can see many videos on YouTube of judges imposing contempt charges/punishments for people with no mention of a way to avoid the punishment. That the judge gave the officer a way out is just a gift/bonus for the officer. As far as “attorney Joanne Cuccia”, there is no indication that she will unreasonably withhold acceptance of his apology if it is sincere, and that’s irrelevant until after he gives the apology. If his apology is sincere, and she doesn’t accept it, he can make the case then that she is acting unfairly or unreasonably. This is only to prevent him from making an insincere apology like: “OK, I’m sorry I got caught taking your papers”. The Officer's actions (issue a sincere apology at a press conference) are necessary, but not sufficient for him to stay out of jail. If Ms. Cuccia does not accept the apology, then the Officer goes to jail. I assume that this is what Mr. Liddy is referring too (but maybe I am a moron too, Jsun). Just out of curiosity, Nick, have you seen any MCSO cars parked outside your house lately? While these fools may think it’s the job of a court deputy to invalidate the integrity of the courtroom like in the military dictatorship of Maricopa County, they are wrong. While we still live under the rule of law, and not a military state, the deputy’s actions are disgusting, and he should not be allowed authority in a courtroom until he understands that he is not above the law. While these fools may think it's the job of a court deputy to invalidate the integrity of the courtroom like in the military dictatorship of Maricopa County, they are wrong. While we still live under the rule of law, and not a military state, the deputy's actions are disgusting, and he should not be allowed authority in a courtroom until he understands that he is not above the law. Fortunately for the first presiding judge, all this attention on the contempt charge has diverted us from the first question that should have been asked: Why did she just sit there and let the deputy read and steal the letter? I realize he was behind the defense attorney, but he was directly in front of the judge, who claimed just a few minutes later that she did not know what was happening! How could this incident seem to be appropriate to her? Isn’t anyone pressing for an investigation? Fortunately for the first presiding judge, all this attention on the contempt charge has diverted us from the first question that should have been asked: Why did she just sit there and let the deputy read and steal the letter? I realize he was behind the defense attorney, but he was directly in front of the judge, who claimed just a few minutes later that she did not know what was happening! How could this incident seem to be appropriate to her? Isn't anyone pressing for an investigation? Arpaio surely needs to be removed as Sheriff. It is insulting to the operation of law to allow a Deputy to steal documents from an attorney’s file and go unpunished. A reasonable Sheriff would have fired the Deputy on the spot and the whole thing would have been concluded (although he should have been charged with a crime!). For a Sheriff to defend the theft committed by a Deputy (on video! ), as justified, is ridiculous. What is wrong with the people of Phoenix? How can they re-elect such an idiot? And where did they find the idiot lawyer, Liddy, that obviously knows nothing about the lawy of contempt ro first amendment rights or crime? Does anyone know if he actually has a law license? Arpaio surely needs to be removed as Sheriff. It is insulting to the operation of law to allow a Deputy to steal documents from an attorney's file and go unpunished. A reasonable Sheriff would have fired the Deputy on the spot and the whole thing would have been concluded (although he should have been charged with a crime!). For a Sheriff to defend the theft committed by a Deputy (on video! ), as justified, is ridiculous. I don’t understand why he was not charged with theft? If a citizen did this they would be in a lot more trouble than simply apologizing. The sheriffs decision not to apologize is beyond stupid. Stoddard should be arrested and then fired. Why does the public allow this type of two justice systems one for the police and one for us. I think an apology is insufficient and undermines law and order. There is no law and order if there is two justice systems. This really shows the entire justice system is broken and the lack of law.I would know that taking the file was illegal and wrong and protected. Stoddard works there every day and so he definitely knew his actions were illegal except the system is so corrupt that this moron thought he could do as he pleased even in a court of law. He does not respect the judge or the court or the law. It does not matter what reason he had for stealing or that he returned it. The guy being tried should get a pass or the case dismissed.